ORLANDO, Fla. (AP) On a team that’s at its best when consistently moving the ball, there are times Aaron Gordon seems to be working counter his Orlando Magic teammates. But Gordon’s habit of taking quick shots and playing isolation basketball came up big for the Magic during their 125-121 comeback win over Brooklyn on Tuesday night. Gordon scored a career-high 41 points, including the go-ahead 3-pointer with 36 seconds remaining. Gordon was 5 for 5 from 3-point range and converted 14 of 18 from the field in 37 minutes. There were times when Gordon’s penchant for rushing shots worked against the Magic, especially as they fell behind by as many as 12 points in third quarter. But Gordon remained aggressive all night and defended his actions on the floor after the game. Gordon had missed the Magic’s previous two games, a close loss to Brooklyn and a blowout win over Cleveland on Saturday, with an ankle injury. In both games the team benefited from good ball movement and shot selection. They shot 51 percent and had 30 assists in last week’s five-point loss to the Nets, then had 28 more assists in the victory at Cleveland. But against the Nets on Tuesday night, Orlando (3-1) finished with just 20 assists on 41 baskets. But when the Magic got back to the style of play that suits them best they were able to bounce back in the fourth quarter against a Nets team that had taken a commanding lead by scoring on fast breaks and in transitions off Orlando misses. It looked as though the Nets (2-2) would have their second win of the season over the Magic when DeMarre Carroll snatched a rebound out of Nikola Vucevic’s hands and took the ball up for the go-ahead layup with 48 seconds remaining. But Gordon answered with his 3-pointer followed by two free throws by Fournier for the four-point win. The Nets missed three consecutive 3-point shots in the waning moments to end the game. D’Angelo Russell finished with 29 points for the Nets. Nets: Russell made his first four 3-pointers in the opening five minutes of the opening quarter. Russell finished the first half with 15 points after cooling off the remainder of the half. 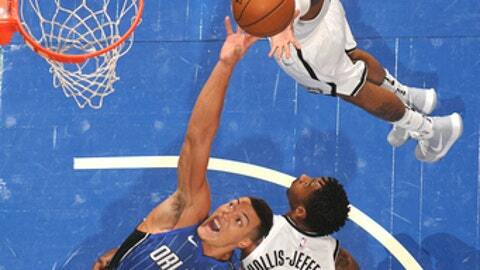 … The Nets outscored Orlando 9-4 on second-chance points and 12-6 on fast-break points during the first two quarters. Magic: Point guard Elfrid Payton missed his second straight game with a hamstring strain. Coach Frank Vogel said he is unsure when Payton will be ready to go. … Vucevic, who had been the Magic’s most consistent player in their first three games, got off to a slow start. He was 3 for 10 from the field and 0 for 3 from 3-point range to finish the first half with just six points. Vucevic ended the night with 12 points, which included a 0-for-5 showing from 3-point range and just 6 of 17 from the floor. ”I think we’re two teams struggling to push up in this league and struggling to make strides. There is a lot of energy there and a lot of want from our guys to kind of improve themselves from last year.” – Atkinson, on the improvement of both Brooklyn and Orlando. Nets: Host Cleveland on Wednesday night. Magic: Hosts San Antonio on Friday night.